Traveling may be something that your client enjoys, and with the added free time of retirement, it may be something they are able to do often. However, seniors with limited mobility may require the use of a wheelchair to get around an airport, which can make getting through security a challenge. Level of mobility: All flyers must be screened in some manner, so it's important to first make the TSA aware of mobility issues. 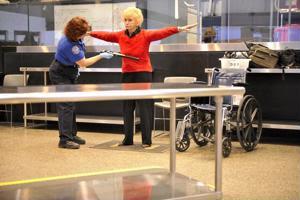 If they can stand and walk, seniors might be asked to step through the metal detector, but if they must remain in the wheelchair, they will be screened through a pat down. Call ahead: It can be useful for seniors traveling who need a wheelchair to call the airport ahead of time and find out about the security procedures. Letting the airport know about the wheelchair will offer time for accommodations to be made. There's a hotline called TSA Cares, which can be reached toll-free at 1-855-787-2227, that was created with help travelers with disabilities and other ailments get through security easier, and it's recommended that individuals call 72 hours ahead of departure time.